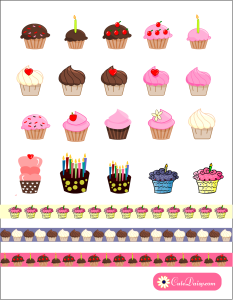 Today i made 20 adorable and free printable Cupcake Planner stickers and Washi tapes. 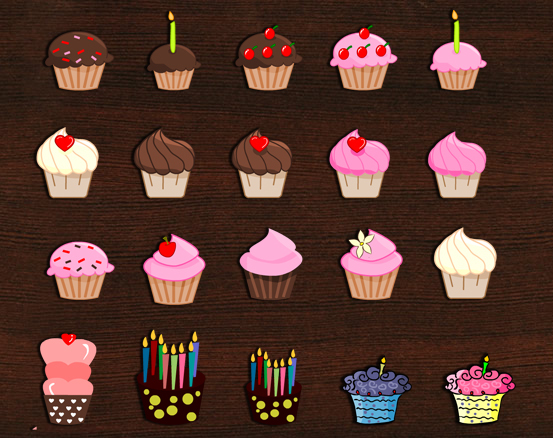 You can use these adorable stickers to mark the birthdays of your loved ones, your own birthdays and you can use these just like that to decorate your planner. 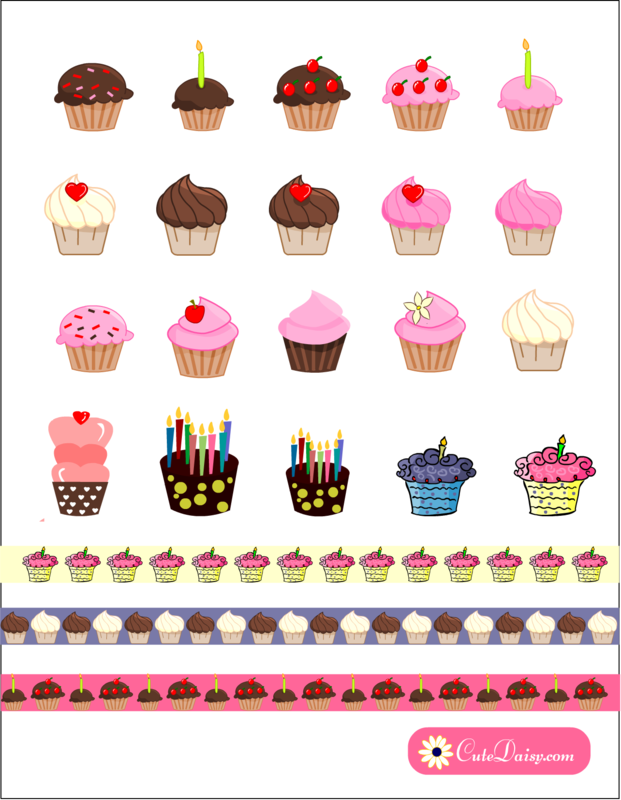 If you are seeking more cute birthday related stickers for your planner then must check out my free printable birthday planner stickers sampler kit. Each of these stickers is approximately 1 inch in size but you can adjust the size through your printer while taking a print out. You can use these stickers in any type of planner, whether it is a Happy Planner, an Erin Condren Planner or just a bullet Journal. You can beautify anything with these adorable stickers. 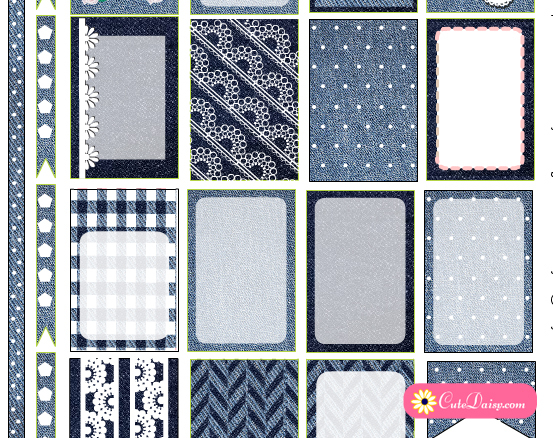 You can print these stickers on Avery sticker sheet or any ordinary paper and paste in your planner with glue. Click on this image to save the PNG version of these adorable stickers. You can download the high resolution PDF file for printing here. 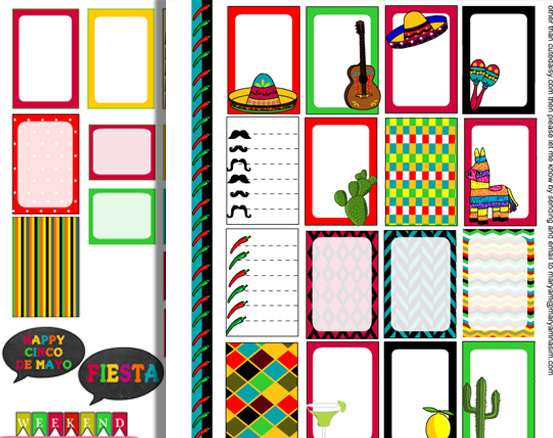 If you want to get some more free fun birthday related printables which are not made for planners go to this link. If you are having a birthday party and want to play some free fun games you can get many birthday games here. Love these! Lots of birthdays coming up for me!! Thank you Thank you. These are adorable. I will use them a lot!! Thank you so much! for your time in creating these wonderful stickers and sharing them with us. It’s a good thing I have a large pack of sticker paper because I have been printing just about ALL of your designs for my planner. They’re so cute! I end up decorating weeks in advance because I just cannot get enough of the cute designs and these will be perfect for my birthday week!! Thank you!! Thank you so much for creating and sharing these wonderful stickers . From Portugal!